The Tiger I listen (help·info) is a German heavy tank of World War II deployed from 1942 in Africa and Europe, usually in independent heavy tank battalions. Its final designation was Panzerkampfwagen VI Tiger Ausf. E often shortened to Tiger. The Tiger I gave the German Army its first armoured fighting vehicle that mounted the 8.8 cm KwK 36 gun (not to be confused with the 8.8 cm Flak 36). 1,347 were built between August 1942 and August 1944. After August 1944, production of the Tiger I was phased out in favour of the Tiger II. While the Tiger I has been called an outstanding design for its time, it was over-engineered, using expensive materials and labour-intensive production methods. The Tiger was prone to certain types of track failures and breakdowns, and was limited in range by its high fuel consumption. It was expensive to maintain, but generally mechanically reliable. It was difficult to transport, and vulnerable to immobilisation when mud, ice, and snow froze between its overlapping and interleaved Schachtellaufwerk-pattern road wheels, often jamming them solid. This was a problem on the Eastern Front in the muddy rasputitsa season and during periods of extreme cold. 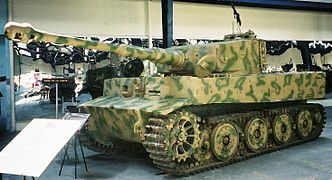 The tank was given its nickname "Tiger" by Ferdinand Porsche, and the Roman numeral was added after the later Tiger II entered production. The initial designation was Panzerkampfwagen VI Ausführung H (‘‘Panzer VI version H’’, abbreviated PzKpfw VI Ausf. H) where 'H' denoted Henschel as the designer/manufacturer. It was classified with ordnance inventory designation Sd.Kfz. 182. The tank was later re-designated as PzKpfw VI Ausf. E in March 1943, with ordnance inventory designation Sd.Kfz. 181. Today, only seven Tiger I tanks survive in museums and private collections worldwide. The Tiger 131 at the UK's Tank Museum, which was captured during the North Africa Campaign, is currently the only one restored to running order. Henschel & Sohn began the development of a large tank design in January 1937 when the Waffenamt requested Henschel to develop a Durchbruchwagen ("breakthrough vehicle") in the 30–33 tonne range. Only one prototype hull was ever built and it was never fitted with a turret. The Durchbruchwagen I's general shape and suspension resembled the Panzer III, while the turret resembled the early Panzer IV C turret with the short-barrelled 7.5 cm L/24 cannon. Before Durchbruchwagen I was completed, a request was issued for a heavier 30-tonne class vehicle with thicker armour; this was the Durchbruchwagen II, which would have had 50 mm (2 in) of frontal armour and mounted a Panzer IV turret with a short-barrelled 7.5 cm L/24 gun. Overall weight would have been 36 tonnes. Only one hull was built and no turret was fitted. Further development of the Durchbruchwagen was dropped in 1938 in favour of the larger and better-armoured VK 30.01 (H) and VK 36.01 (H) designs. [c] Both the Durchbruchwagen I and II prototype hulls were used as test vehicles until 1941. The VK 30.01 (H) medium tank and the VK 36.01 (H) heavy tank designs pioneered the use of the complex Schachtellaufwerk track suspension system of torsion bar-sprung, overlapped and interleaved main road wheels for tank use. This concept was already common on German half-tracks such as the Sd.Kfz. 7. The VK 30.01 (H) was intended to mount a low-velocity 7.5 cm L/24 infantry support gun, a 7.5 cm L/40 dual purpose anti-tank gun, or a 10.5 cm L/28 field gun in a Krupp turret. Overall weight was to be 33 tonnes. The armour was designed to be 50 mm on frontal surfaces and 30 mm on the side surfaces. Four prototype hulls were completed for testing. Two of these were later modified to build the "Sturer Emil" (12.8 cm Selbstfahrlafette L/61) self-propelled anti-tank gun. The VK 36.01 (H) was intended to weigh 40 tonnes, with 100 mm (4 in) of armour on front surfaces, 80 mm on turret sides and 60 mm on the hull sides. The VK 36.01 (H) was intended to carry a 7.5 cm L/24, or a 7.5 cm L/43, or a 7.5 cm L/70, or a 12.8 cm L/28 cannon in a Krupp turret that looked similar to an enlarged Panzer IV Ausf. C turret. The hull for one prototype was built, followed later by five more. The six turrets built were never fitted and were used as part of the Atlantic Wall. The VK 36.01 (H) project was discontinued in early 1942 in favour of the VK 45.01 project. Combat experience against the French SOMUA S35 cavalry tank and Char B1 heavy tank, and the British Matilda II infantry tanks during the Battle of France in June 1940 showed that the German Army needed better armed and armoured tanks. On 26 May 1941, Henschel and Ferdinand Porsche were asked to submit designs for a 45-tonne heavy tank, to be ready by June 1942. Porsche worked on an updated version of their VK 30.01 (P) Leopard tank prototype while Henschel worked on an improved VK 36.01 (H) tank. Henschel built two prototypes: a VK 45.01 (H) H1 with an 8.8 cm L/56 cannon, and a VK 45.01 (H) H2 with a 7.5 cm L/70 cannon. On 22 June 1941, Germany launched Operation Barbarossa, the invasion of the Soviet Union. The Germans were shocked to encounter Soviet T-34 medium and KV-1 heavy tanks, and, according to Henschel designer Erwin Aders: "There was great consternation when it was discovered that the Soviet tanks were superior to anything available to the Heer.". An immediate weight increase to 45 tonnes and an increase in gun calibre to 8.8 cm was ordered. The due date for the new prototypes was set for 20 April 1942, Adolf Hitler's 53rd birthday. Unlike the Panther tank, the designs did not incorporate sloped armour, an innovation taken from the T-34. Porsche and Henschel submitted prototype designs, each making use of the Krupp-designed turret. They were demonstrated at Rastenburg in front of Hitler. The Henschel design was accepted, mainly because the Porsche VK 4501 (P) prototype design used a troubled gasoline-electric hybrid power unit which needed large quantities of copper for manufacture of its electrical drivetrain components, a strategic war material of which Germany had limited supplies with acceptable electrical properties for such uses. Production of the Panzerkampfwagen VI Ausf. H began in August 1942. Expecting an order for his tank, Porsche built 100 chassis. After the contract was awarded to Henschel, they were used for a new turretless, casemate-style tank destroyer; 91 hulls were converted into the Panzerjäger Tiger (P) in early 1943. The Tiger was still at the prototype stage when it was first hurried into service, and therefore changes both large and small were made throughout the production run. A redesigned turret with a lower cupola was the most significant change. To cut costs, the submersion capability and an external air-filtration system were dropped. 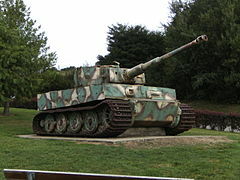 The Tiger differed from earlier German tanks principally in its design philosophy. Its predecessors balanced mobility, armour and firepower, and were sometimes outgunned by their opponents. While heavy, this tank was not slower than the best of its opponents. However, at over 50 tonnes dead weight, the suspension, gearboxes, and other such items had clearly reached their design limits and breakdowns were frequent if regular maintenance was not undertaken. Although the general design and layout were broadly similar to the previous medium tank, the Panzer IV, the Tiger weighed more than twice as much. This was due to its substantially thicker armour, the larger main gun, greater volume of fuel and ammunition storage, larger engine, and a more solidly built transmission and suspension. The Tiger I had frontal hull armour 100 mm (3.9 in) thick, frontal turret armour of 100 mm (3.9 in) and a 120 mm (4.7 in) thick gun mantlet. The Tiger had 60 mm (2.4 in) thick hull side plates and 80 mm armour on the side superstructure/sponsons, while turret sides and rear were 80 mm. The top and bottom armour was 25 mm (1 in) thick; from March 1944, the turret roof was thickened to 40 mm (1.6 in). Armour plates were mostly flat, with interlocking construction. The armour joints were of high quality, being stepped and welded rather than riveted and were made of maraging steel. The 56-calibre long 8.8 cm KwK 36 was chosen for the Tiger. A combination of a flat trajectory from the high muzzle velocity and precision from Leitz Turmzielfernrohr TZF 9b sight (later replaced by the monocular TZF 9c) made it very accurate. In British wartime firing trials, five successive hits were scored on a 410 by 460 mm (16 by 18 in) target at a range of 1,100 metres (3,600 ft). Compared with the other contemporary German tank guns, the 8.8 cm KwK 36 had superior penetration to the 7.5 cm KwK 40 on the Sturmgeschütz III and Panzer IV but inferior to the 7.5 cm KwK 42 on the Panther tank under ranges of 2,500 metres. At greater ranges, the 8.8 cm KwK 36 was superior in penetration and accuracy. The ammunition for the Tiger had electrically fired primers. Four types of ammunition were available but not all were fully available; the PzGr 40 shell used tungsten, which was in short supply as the war progressed. The rear of the tank held an engine compartment flanked by two separate rear compartments each containing a fuel tank and radiator. The Germans had not developed an adequate diesel engine, so a petrol (gasoline) powerplant had to be used instead. The original engine utilised was a 21.35-litre (1303 cu.in.) 12-cylinder Maybach HL 210 P45 developing 485 kW (650 hp) at 3,000 rpm. Although a good engine, it was underpowered for the vehicle. From the 251st Tiger onwards, it was replaced by the upgraded HL 230 P45, a 23.095 litre (1409 cu.in.) engine developing 521 kW (700 hp) at 3,000 rpm. The main difference between these engines was that the original Maybach HL 210 used an aluminium engine block while the Maybach HL 230 used a cast-iron engine block. The cast-iron block allowed for larger cylinders (and thus, greater displacement) which increased the power output to 521 kW (700 hp). The engine was in V-form, with two cylinder banks set at 60 degrees. An inertia starter was mounted on its right side, driven via chain gears through a port in the rear wall. The engine could be lifted out through a hatch on the rear hull roof. In comparison to other V12 and various vee-form gasoline engines used for tanks, the eventual HL 230 engine was nearly four litres smaller in displacement than the Allied British Rolls-Royce Meteor V12 AFV powerplant, itself adapted from the RR Merlin but de-rated to 448 kW (600 hp) power output; and the American Ford-designed precursor V12 to its Ford GAA V-8 AFV engine of 18 litre displacement, which in its original V12 form would have had the same 27 litre displacement as the Meteor. The engine drove the front sprockets through a drivetrain connecting to a transmission in the front portion of the lower hull; the front sprockets had to be mounted relatively low as a result. The Krupp-designed 11-tonne turret had a hydraulic motor whose pump was powered by mechanical drive from the engine. A full rotation took about a minute. Another new feature was the Maybach-Olvar hydraulically controlled semi-automatic pre-selector gearbox. The extreme weight of the tank also required a new steering system. Germany's Argus Motoren, where Hermann Klaue had invented a ring brake in 1940, supplied them for the Arado Ar 96 and also supplied the 55 cm disc. Klaue acknowledged in the patent application that he had merely improved on existing technology, that can be traced back to British designs dating to 1904. It is unclear whether Klaue's patent ring brake was utilised in the Tiger brake design. The clutch-and-brake system, typical for lighter vehicles, was retained only for emergencies. Normally, steering depended on a double differential, Henschel's development of the British Merritt-Brown system first encountered in the Churchill tank. The vehicle had an eight-speed gearbox, and the steering offered two fixed radii of turns on each gear, thus the Tiger had sixteen different radii of turn. In first gear, at a speed of a few km/h, the minimal turning radius was 3.44 m (11 ft 3 in). 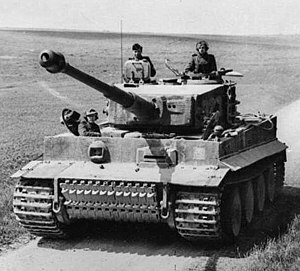 In neutral gear, the tracks could be turned in opposite directions, so the Tiger I pivoted in place. There was a steering wheel instead of either a tiller — or, as most tanks had at that time, twin braking levers — making the Tiger I's steering system easy to use, and ahead of its time. The suspension used sixteen torsion bars, with eight suspension arms per side. To save space, the swing arms were leading on one side and trailing on the other. There were three road wheels (one of them double, closest to the track's centre) on each arm, in a so-called Schachtellaufwerk overlapping and interleaved arrangement, similar to that pioneered on German half-tracked military vehicles of the pre-World War II era, with the Tiger I being the first all-tracked German AFV built in quantity to use such a road wheel arrangement. The wheels had a diameter of 800 mm (31 in) in the Schachtellaufwerk arrangement for the Tiger I's suspension, providing a high uniform distribution of the load onto the track, at the cost of increased maintenance. Removing an inner wheel that had lost its solid rubber tire (a common occurrence) required the removal of up to nine other wheels first. During the rainy period that brought on the autumn rasputitsa mud season and onwards into the winter conditions on the Eastern front, the roadwheels of a Schachtellaufwerk-equipped vehicle could also become packed with mud or snow that could then freeze. Presumably, German engineers, based on the experience of the half tracks, felt that the improvement in off-road performance, track and wheel life, mobility with wheels missing or damaged, plus additional protection from enemy fire was worth the maintenance difficulties of a complex system vulnerable to mud and ice. This approach was carried on, in various forms, to the Panther and the non-interleaved wheel design for the Tiger II. Eventually, a new 80 cm diameter 'steel' wheel design, closely resembling those on the Tiger II, with an internally sprung steel-rim tire was substituted, and which like the Tiger II, were only overlapped and not interleaved. 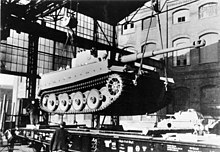 Tiger at the Henschel plant is loaded onto a special rail car. The outer road wheels have been removed and narrow tracks put in place to decrease vehicle width, allowing it to fit within the loading gauge of the German rail network. To support the considerable weight of the Tiger, the tracks were 725 mm (2 ft 4.5 in) wide. To meet rail-freight size restrictions, the outermost roadwheel on each axle (16 total) could be unbolted from a flange  and narrower 520��mm (20 in) wide 'transport' tracks (Verladeketten) installed. The track replacement and wheel removal took 30 minutes for each side of the tank. However, in service, Tigers were frequently transported by rail with their combat tracks fitted, as long as the train crew knew there were no narrow tunnels or other obstructions on the route that would prevent an oversized load from passing, despite this practice being strictly forbidden. The Tiger tank's combat weight of 56 tons was often too heavy for small bridges which had 35 ton weight limits, so it was designed to ford bodies of water up to 15 ft (4.6 m) deep. This required unusual mechanisms for ventilation and cooling when underwater. At least 30 minutes of set-up time was required, with the turret and gun being locked in the forward position, and a large snorkel tube raised at the rear. An inflatable doughnut-shaped ring sealed the turret ring. The two rear compartments (each containing a fuel tank, radiator and fans) were floodable. Only the first 495 units were fitted with this deep fording system; all later models were capable of fording water only two metres deep. However, this ability was found to be a limited practical value for its expensive cost and was removed from production lines in August 1943. The internal layout was typical of German tanks. Forward was an open crew compartment, with the driver and radio-operator seated at the front on either side of the gearbox. Behind them the turret floor was surrounded by panels forming a continuous level surface. This helped the loader to retrieve the ammunition, which was mostly stowed above the tracks. Three men were seated in the turret; the loader to the right of the gun facing to the rear, the gunner to the left of the gun, and the commander behind him. There was also a folding seat on the right for the loader. The turret had a full circular floor and 157 cm headroom. Early versions of the Tiger I's turret included two pistol ports however one these was replaced with a loader escape hatch and the other deleted from later designs. Post-war testing by the Allies found the tank to be uncomfortable and spartan. This was in contrast to German crews who found them to be spacious and comfortable. The main problem with the Tiger was that its production required considerable resources in terms of manpower and material, which led to it being expensive: the Tiger I cost over twice as much as a Panzer IV and four times as much as a StuG III assault gun. Partly because of their high cost, only 1,347 Tiger I and 492 Tiger II tanks were produced. The closest counterpart to the Tiger from the United States was the M26 Pershing (around 200 deployed to the European Theater of Operations (ETO) during the war[page needed]) and the IS-2 from the USSR (about 3,800 built during the conflict). From a technical point of view it was superior to its contemporaries, and despite the low number produced, shortages in qualified crew and the considerable fuel requirement in a context of ever shrinking resources, Tiger tanks had a large impact in the war with Tigers (including Tiger IIs) destroying at least 10,300 enemy tanks, and 11,380 AT guns and artillery pieces in WW2. This was achieved for the loss of 1,725 Tigers (including large numbers of operational and strategic losses, i.e abandoned, broken down, etc). Production of the Tiger I began in August 1942 at the factory of Henschel und Sohn in Kassel, initially at a rate of 25 per month and peaking in April 1944 at 104 per month. An official document of the time stated that the first Tiger I was completed in August 4. 1,355 had been built by August 1944, when production ceased. Deployed Tiger I's peaked at 671 on 1 July 1944. It took about twice as long to build a Tiger I as another German tank of the period. When the improved Tiger II began production in January 1944, the Tiger I was soon phased out. In 1943, Japan bought several specimens of German tank designs for study. A single Tiger I was apparently purchased, along with a Panther and two Panzer IIIs, but only the Panzer IIIs were actually delivered. The undelivered Tiger was loaned to the German Wehrmacht by the Japanese government. Many modifications were introduced during the production run to improve automotive performance, firepower and protection. Simplification of the design was implemented, along with cuts due to raw material shortages. In 1942 alone, at least six revisions were made, starting with the removal of the Vorpanzer (frontal armour shield) from the pre-production models in April. In May, mudguards bolted onto the side of the pre-production run were added, while removable mudguards saw full incorporation in September. Smoke discharge canisters, three on each side of the turret, were added in August 1942. In later years, similar changes and updates were added, such as the addition of Zimmerit (a non-magnetic anti-mine coating), in late 1943. Due to slow production rates at the factories, incorporation of the new modifications could take several months. The humorous and somewhat racy crew manual, the Tigerfibel, was the first of its kind for the German Army and its success resulted in more unorthodox manuals that attempted to emulate its style. Among other variants of the Tiger, a citadel, heavily armoured self-propelled rocket projector, today commonly known as the Sturmtiger, was built. A tank recovery version of the Porsche Tiger I (Bergetiger), and one Porsche Tiger I, was issued to the 654th Heavy Tank Destroyer Battalion, which was equipped with the Ferdinand/Elefant. In Italy, a demolition carrier version of the Tiger I without a main gun was built by maintenance crews in an effort to find a way to clear minefields. It is often misidentified as a BergeTiger recovery vehicle. As many as three may have been built. It carried a demolition charge on a small crane on the turret in place of the main gun. It was to move up to a minefield and drop the charge, back away, and then set the charge off to clear the minefield. There is no verification of any being used in combat. Another variant was the Fahrschulpanzer VI Tiger tanks (driving school Tiger tanks). These tanks were Tigers with modified engines to run on either compressed Towngas gas (Stadtgas System) or wood gas (Holzgas System). This was due to shortages in fuel supply. They used a mixture of turreted and turretless hulls. They were used to train Tiger tank crews. They were not used in combat. Hitler's order, dated 27 February 1944, abolished the designation Panzerkampfwagen VI and ratified Panzerkampfwagen Tiger Ausf. E, which was the official designation until the end of the war. For common use it was frequently shortened to Tiger. German soldiers inspect a non-penetrating hit to the Tiger's armour. A report prepared by the Waffenamt-Prüfwesen 1 gave the calculated probability of perforation at range, on which various adversaries would be defeated reliably at a side angle of 30 degrees to the incoming round. The Wa Pruef report estimated that the Tiger's 88 mm gun would be capable of penetrating the differential case of an American M4 Sherman from 2,100 m (1.3 mi) and the turret front from 1,800 m (1.1 mi), but the Tiger's 88 mm gun would not penetrate the upper glacis plate at any range. The M4 Sherman's 75 mm gun would not penetrate the Tiger frontally at any range, and needed to be within 100 m to achieve a side penetration against the 80 mm upper hull superstructure. The Sherman's upgraded 76 mm gun might penetrate the Tiger's driver's front plate from 600 m, the nose from 400 m and the turret front from 700 m. The M3 90 mm cannon used as a towed anti-aircraft and anti-tank gun, and later mounted in the M36 tank destroyer and finally the late-war M26 Pershing, could penetrate the Tiger's front plate at a range of 1,000 m using standard ammunition, and from beyond 2,000 m when using HVAP. Soviet ground trial testing conducted in May 1943 determined that the 8.8 cm KwK 36 gun could pierce the T-34/76 frontal beam nose of 140 mm thickness from 1500 m, and the front hull from 1500 m. A hit to the driver's hatch would force it to collapse inward and break apart. [f] According to the WaPrüf, the Soviet T-34-85's upper glacis and turret front armour would be defeated between 100 and 1,400 m (0.062 and 0.870 mi), while the T-34's 85 mm gun would penetrate the front of a Tiger between 200 and 500 m (0.12 and 0.31 mi). The 120 mm hull armour of the Soviet IS-2 model 1943 would be defeated between 100 and 300 m (0.062 and 0.186 mi) at the driver's front plate and nose. The IS-2's 122 mm gun could penetrate the Tiger's front armour from between 500 and 1,500 m (0.31 and 0.93 mi). However, according to Steven Zaloga, the IS-2 and Tiger I could each knock the other out in normal combat distances below 1,000 m. At longer ranges, the performance of each respective tank against each other was dependent on the crew and the combat situation. 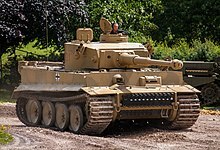 The British Churchill IV would become vulnerable to the Tiger at between 1,100 and 1,700 m (0.68 and 1.06 mi), its strongest point being the nose and its weakest the turret. According to an STT document dated April 1944, it was estimated that the British 17-pounder, as used on the Sherman Firefly, firing its normal APCBC ammunition, would penetrate the turret front and driver's visor plate of the Tiger out to 1,900 yards (1,700 m). The destruction of an antitank gun was often accepted as nothing special by lay people and soldiers from other branches. Only the destruction of other tanks counted as a success. On the other hand, antitank guns counted twice as much to the experienced tanker. They were much more dangerous to us. The antitank cannon waited in ambush, well camouflaged, and magnificently set up in the terrain. Because of that, it was very difficult to identify. It was also very difficult to hit because of its low height. Usually, we didn't make out the antitank guns until they had fired the first shot. We were often hit right away, if the antitank crew was on top of things, because we had run into a wall of antitank guns. It was then advisable to keep as cool as possible and take care of the enemy, before the second aimed shot was fired. Eager to make use of the powerful new weapon, Hitler ordered the vehicle be pressed into service months earlier than had planned. A platoon of four Tigers went into action on 23 September 1942 near Leningrad. Operating in swampy, forested terrain, their movement was largely confined to roads and tracks, making defence against them far easier. Many of these early models were plagued by problems with the transmission, which had difficulty handling the great weight of the vehicle if pushed too hard. It took time for drivers to learn how to avoid overtaxing the engine and transmission, and many broke down. The most significant event from this engagement was that one of the Tigers became stuck in swampy ground and had to be abandoned. Captured largely intact, it enabled the Soviets to study the design and prepare countermeasures. The 503rd Heavy Panzer Battalion was deployed to the Don Front in the autumn of 1942, but arrived too late to participate in Operation Winter Storm, the attempt to relieve Stalingrad. It was subsequently engaged in heavy defensive fighting in the Rostov-on-Don and adjacent sectors in January and February 1943. In the North African Campaign, the Tiger I first saw action during the Tunisia Campaign on 1 December 1942 east of Tebourba when three Tigers attacked an olive grove 5 km west of Djedeida. The thick olive grove made visibility very limited and enemy tanks were engaged at close range. The Tigers were hit by a number of M3 Lee tanks firing at a range of 80 to 100 metres. Two of the Lees were knocked out in this action. The Tiger tanks proved that they had excellent protection from enemy fire; this greatly increased the crew's trust in the quality of the armour. The first loss to an Allied gun was on 20 January 1943 near Robaa, when a battery of the British 72nd Anti-Tank Regiment knocked out a Tiger with their 6-pounder (57 mm) anti-tank guns. Seven Tigers were immobilised by mines during the failed attack on Béja during Operation Ochsenkopf at the end of February. On July 1943, two heavy tank battalions (503rd and 505th) took part in Operation Citadel resulting in the Battle of Kursk with one battalion each on the northern (505th) and southern (503rd) flanks of the Kursk salient the operation was designed to encircle. However, the operation failed and the Germans were again put on the defensive. The resulting withdraw led to the loss of many broken-down Tigers which were left unrecovered, battalions unable to do required maintenance or repairs. On 11 April 1945, a Tiger I destroyed three M4 Sherman tanks and an armoured car advancing on a road. On 12 April 1945, a Tiger I (F02) destroyed two Comet tanks, one halftrack and one scout car. This Tiger I was destroyed by a Comet tank of A Squadron of the 3rd Royal Tank Regiment on the next day without infantry support. The tank's weight significantly limited its use of bridges. For this reason, the Tiger was built with water tight hatches and a snorkel device that allowed it to ford water obstacles four metres deep. The tank's weight also made driving through buildings risky, as the presence of a cellar could result in a sudden drop. Another weakness was the slow traverse of the hydraulically operated turret. Due to reliability problems with the Maybach HL 210 TRM P45, which was delivered within the first production batch of 250 Tigers, performance for its maximum power output at high gear ratio could not be fulfilled. Though the Maybach engines had a maximum of 3,000 rpm, crews were told in the Tigerfibel not to exceed 2,600 rpm. The engine limitation was alleviated only by the adoption of the Maybach HL 230. A British Army test report showed that the turret on the Tiger E tank turned 360 degrees, at 19º/second, with its power traverse system set at high ratio and with the engine speed at 2,000 revolutions per minute (rpm). The turret could also be traversed manually, but this option was rarely used, except for very small adjustments. Early Tigers had a top speed of about 45 kilometres per hour (28 mph) over optimal terrain. This was not recommended for normal operation, and was discouraged in training. An engine governor was subsequently installed, capping the engine at 2,600 rpm and the Tiger's maximum speed to about 38 kilometres per hour (24 mph). Tiger crews report that typical march speed off-road was 10 kilometers per hour (6 mph). However, medium tanks of the time, such as the Sherman or T-34, had on average a top speed of about 45 kilometres per hour (28 mph). Thus, despite the Tiger being nearly twice as heavy, its speed was comparatively respectable. With the tank's very wide tracks, a design feature borrowed from the Soviet T-34, the Tiger had a lower ground pressure than many smaller tanks, such as the M4 Sherman. Tiger I tanks needed a high degree of support. It required two or sometimes three of the standard German Sd.Kfz. 9 Famo heavy recovery half-track tractors to tow it. Tiger crews often resorted to using another Tiger to tow the damaged vehicle, but this was not recommended as it often caused overheating and engine breakdown. The low-mounted sprocket limited the obstacle clearance height. The tracks also had a tendency to override the rear sprocket, resulting in immobilisation. If a track overrode and jammed, two Tigers were normally needed to tow the tank. The jammed track was also a big problem itself, since due to high tension, it was often impossible to split the track by removing the track pins. The track sometimes had to be blown apart with a small explosive charge. The average reliability of the Tiger tank in the second half of 1943 was similar to that of the Panther, 36%, compared to the 48% of the Panzer IV and the 65% of the StuG III. From May 1944 to March 1945, the reliability of the Tiger tank was as good as the Panzer IV. With an average of 70%, the Tiger's operational availability on the Western Front, was better than compared to 62% of Panthers. On the Eastern Front, 65% of Tigers were operationally available, compared to the 71% of Panzer IVs and 65% of Panthers. Tigers were usually employed in separate heavy tank battalions (schwere Panzer-Abteilung) under army command. These battalions would be deployed to critical sectors, either for breakthrough operations or, more typically, counter-attacks. A few favoured divisions, such as the Grossdeutschland, and the 1st SS Leibstandarte Adolf Hitler, 2nd SS Das Reich, and 3rd SS Totenkopf Panzergrenadier Divisions at Kursk, had a Tiger company in their tank regiments. The Grossdeutschland Division had its Tiger company increased to a battalion as the III Panzer Battalion of the Panzer Regiment Grossdeutschland. 3rd SS Totenkopf retained its Tiger I company through the entire war. 1st SS and 2nd SS had their Tiger companies taken away and incorporated into the 101st SS Tiger Battalion, which was part of 1st SS Panzer Corps. The Tiger was originally designed to be an offensive breakthrough weapon, but by the time it went into action, the military situation had changed dramatically, and its main use was on the defensive, as a mobile anti-tank and infantry gun support weapon. Tactically, this also meant moving the Tiger units constantly to parry breakthroughs, causing excessive mechanical wear. As a result, there are almost no instances where a Tiger battalion went into combat at anything close to full strength. Against the Soviet and Western Allied production numbers, even a 10:1 kill ratio was not sufficient. These numbers must be set against the opportunity cost of the expensive Tiger. Every Tiger cost as much to build as four Sturmgeschütz III assault guns. Tiger I that knocked out the first M26 Pershing in combat. It then backed into a pile of rubble and became stuck, leading to the crew abandoning it. The British had observed the gradual increase in German AFV armour and firepower since 1940 and had anticipated the need for more powerful anti-tank guns. Work on the 76.2 mm calibre Ordnance QF 17 pounder had begun in late 1940 and in 1942 100 early-production guns were rushed to North Africa to help counter the new Tiger threat. The gun carriage had not yet been developed, and the guns were mounted on the carriages of 25-pounder gun/howitzers and were known by the code name "Pheasant". Efforts were hastened to get cruiser tanks armed with 17-pounder guns into operation. The A30 Challenger was already at the prototype stage in 1942, but this tank was relatively unprotected, having a front hull thickness of 64 mm, and in the end was fielded in only limited numbers (around 200 were ordered in 1943), though crews liked it for its high speed. The Sherman Firefly, armed with the 17-pounder, was a notable success even though it was only intended to be a stopgap design. Fireflies were successfully used against Tigers; in one engagement, a single Firefly destroyed three Tigers in 12 minutes with five rounds. Over 2,000 Fireflies were built during the war. Five different 17-pounder-armed British designs saw combat during the war: the A30 Challenger, the A34 Comet (using the OQF 77mm HV variant), the Sherman Firefly, the 17pdr SP Achilles, and the 17pdr SP Archer self-propelled gun, while one more, the A41 Centurion, was about to enter service as the European war ended. In 1944 the British introduced an APDS round for the 17-pounder, which increased penetration performance considerably. Initially, the Soviets responded to the Tiger I by restarting production of the 57 mm ZiS-2 anti-tank gun (production was stopped in 1941 in favour of cheaper and more versatile alternatives – e.g. the ZiS-3 – as the gun's performance was excessive for early German armour). The ZiS-2 had better armour penetration than the 76 mm F-34 tank gun used by most Red Army tanks, or the ZiS-3 76 mm divisional cannon, but was still inadequate against Tigers. A small number of T-34s were again fitted with a tank version of the ZiS-2, the ZiS-4, but it could not fire an adequate high-explosive round, making it an unsuitable tank gun. Firing trials of the new 85 mm D-5T also had proved disappointing. Several captured German Tiger I tanks were shipped to Chelyabinsk, where they were subjected to 85 mm fire from various angles. The 85 mm gun could not reliably penetrate the Tiger I's armour except at ranges within the lethal envelope of the Tiger I's own 88 mm gun. It was still initially used on the SU-85 self-propelled gun (based on a T-34 chassis) from August 1943. The production of KV heavy tanks armed with the 85 mm D-5T in an IS-85 turret was also started. There was a short production run of 148 KV-85 tanks, which were sent to the front beginning in September 1943 with production ending by December 1943. By early 1944, the T-34/85 appeared; this up-gunned T-34 matched the SU-85's firepower, but with the advantage of mounting the gun in a turret. It also matched the firepower of the heavier IS-85 tank in a more cost effective package resulting in a repeat of the events which heralded the decline of KV-1 production. The IS was subsequently rearmed with the 122 mm D-25T, which with BR–471 AP rounds was capable of going through the Tiger's armour from 1,200 m, and with the improved BR–471B APHEBC rounds at over 2,000 m.[g] The redundant SU-85 was replaced by the SU-100, mounting a 100 mm D-10 tank gun, that could penetrate 149 mm of vertical armour plate at 1,000 m.
In May 1943, the Red Army deployed the SU-152, replaced in 1944 by the ISU-152. These self-propelled guns both mounted the large, 152 mm howitzer-gun. The SU-152 was intended to be a close-support gun for use against German fortifications rather than armour; however, it shared among the later fielded ISU-152, the nickname Zveroboy ("beast killer"), for its rare ability to knock out German heavy tanks. The 152 mm armour-piercing shells weighed over 45 kilograms (99 lb) and could penetrate a Tiger's frontal armour from about 1,000 metres (1,100 yd). Its high-explosive rounds were powerful enough to cause significant damage to a tank, occasionally ripping the turret off outright. However, the size and weight of the ammunition meant both vehicles had a low rate of fire, and each could carry only 20 rounds. The US Army hesitated to place 76 mm M1 guns in action even when they were already available, as combat through early 1944 indicated that the 75 mm M3 was more than adequate for handling the German tank threat. This conclusion was partly based on the correct estimate that Tigers would be encountered in relatively small numbers, and on the assumption that anti-tank gun-fire (as in Tunisia and Sicily) rather than tanks could knock them out. Germany – The main operator. Hungary – 13 examples given by Germany. On 21 April 1943, a Tiger I of the 504th German heavy tank battalion, with turret number 131, was captured on a hill called Djebel Djaffa in Tunisia. A 6-pounder solid shot from a Churchill tank of the British 48th Royal Tank Regiment hit the Tiger's gun barrel and ricocheted into its turret ring, jamming its traverse and wounding the commander. The crew bailed out and the tank was captured. [h][page needed]. After repairs, the tank was sent to England for a thorough inspection. The captured tank was officially handed over to the Bovington Tank Museum by the British Ministry of Supply on 25 September 1951. In June 1990, the tank was removed from display at the museum and work began on its restoration. This was carried out both by the museum and the Army Base Repair Organisation and involved an almost complete disassembly of the tank. The Maybach HL230 engine from the museum's Tiger II was installed (the Tiger's original Maybach HL210 had been sectioned for display), along with a modern fire-suppressant system in the engine compartment. In December 2003, Tiger 131 returned to the museum, restored and in running condition. This Tiger was used in the film Fury, the first time an original, fully mechanically operable Tiger I has appeared in a movie since World War II. Musée des Blindés in Saumur, France. Indoor exhibit in good condition. Mid 1944 version with overlapping roadwheels adopted from the Tiger II, fitted with narrow transport tracks. This Tiger was part of the 2nd company of the SS Heavy Panzer Battalion 102, fought in the Cauville sector, and was abandoned by her crew after a mechanical breakdown. She was recommissioned as Colmar with the 2nd squadron of the 6th Cuirassier Regiment, fighting all the way back to Germany. Vimoutiers, Normandy, France. The "Vimoutiers Tiger tank". Abandoned by its crew in August 1944. Outdoor monument. In poor condition due to the effect of time and the elements. Kubinka Tank Museum, Moscow, Russia, in good condition. Displayed as an indoor exhibit. Military-historical Museum of Lenino-Snegiri, Russia. In very bad condition. As a former firing range target it is badly shot and cut up. Displayed as an outdoor exhibit. Tiger 712 of the 501st Heavy Panzer Battalion is part of the United States Army Armor & Cavalry Museum, Fort Benning, Georgia. In good condition. The left side of the hull and turret were cut-away in the late 1940s for interior training and display purposes. 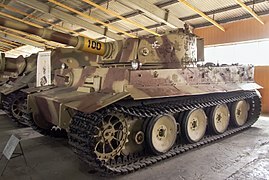 German Panzer Museum, Munster, has a Tiger I now on display. This tank was reconstructed by Mr. Hoebig in Germany, using parts found in the Trun scrapyard in Normandy  and some parts found in Kurland (Latvia). ^ Without weapons, optics, or radio. 399,800 combat ready. ^ Although 1,350 is a common figure, World War II magazine reported the figure of 1,355 in their January 1994 edition (p.16). Jentz gives a revised number of 1,347, including the prototype, the result of the most detailed investigation of the primary sources ever undertaken. ^ The data used here is from the Soviet Military Intelligence Service. With the capture of an intact Tiger at Lake Lagoda the Soviets obtained data regarding the Tiger's technical and tactical capabilities. By test firing the 8.8 cm gun against a T-34 hull, data was obtained that led to several improvements of the T-34 and development of the IS II as a new breakthrough tank. By increasing the thickness of the armour and mounting it with a very heavy 122 mm gun, the Soviet IS II became a very difficult tank to deal with. ^ The conservators have kept the damage caused by the ricochet unpainted; it can be observed at the Bovington Tank museum. ^ Zetterling 2000, p. 61. ^ Jentz & Doyle 1993, pp. 11–13. ^ Jentz & Doyle 2000, p. 177. ^ a b c d e Jentz & Doyle 2000, p. 179. ^ a b c Green, Michael; Brown, James D. (15 February 2008). "Tiger Tanks at War". Voyageur Press. p. 20. ^ a b Jentz & Doyle 1993, pp. 8, 16. ^ Jentz & Doyle 2000, p. 182. ^ Jentz & Doyle 2000, p. 181. ^ Trewhitt, Philip A. (1999). Armored Fighting Vehicles. Barnes & Noble. p. 26. ISBN 0760712603. ^ Bishop 2002, p. 9. ^ Tucker-Jones 2012, p. 7. ^ Green & Brown 2008, pp. 12–13. ^ Green & Brown 2008, p. 13. ^ Green & Brown 2008, p. 14. ^ Carruthers 2013, chapt. "Design features". ^ Jentz & Doyle 1993, p. 6. ^ a b Fabio Prado. "Pzkpfw Vi Tiger I". Armorsite. Retrieved 30 April 2010. ^ Carruthers 2013, chapt. Design features. ^ Bird & Livingston 2001, p. 61. ^ Green & Brown 2008, p. 41. ^ Arado Ar 96, Lexikon der Wehrmacht. ^ Transmission & Steering, Tiger I Information Center. ^ a b c Green & Brown 2008, p. 44. ^ Green & Brown 2008, p. 46. ^ Jentz & Doyle 2000, p. 35. ^ Jentz & Doyle 2000, p. 36. ^ Anderson 2013, p. 69. ^ Anderson 2013, p. 71. ^ a b Forty, George. "Tiger Tank Battalions in World War II". Zenith Imprint. p. 51. ^ Green, Michael; Brown, James D. (15 February 2008). "Tiger Tanks at War". Google Books. Voyageur Press. p. 88. Retrieved 1 January 2019. ^ Forty, George (2009). "Tiger Tank Battalions in World War II". Zenith Imprint. p. 108. ^ Zaloga 2015, p. 204. ^ Askey, Nigel. Operation Barbarossa : the complete organisational and statistical analysis, and military simulation. IngramSparks Publishing. p. 103. ISBN 9780648221920. ^ "The Henschel Tiger Factory". alanbamby.com. Retrieved 12 November 2018. ^ Jentz & Doyle 1993, p. 13. ^ Jentz & Doyle 1993, p. 12. ^ "Sturmmörser: 38 cm Rocket Projector on Tiger E Chassis « Catalog of Enemy Ordnance". www.lonesentry.com. Retrieved 3 September 2018. ^ a b c d e Jentz & Doyle 1993, pp. 19–20. ^ "USA Guns 90mm calibre". Gva.freeweb.hu. Archived from the original on 17 January 2010. Retrieved 30 April 2010. ^ Baryatinsky 2008, pp. 29–30. ^ Kolomiets 2013, p. 92. ^ Zaloga 1994, p. 12. ^ Zaloga 1994, p. 13. ^ Bird & Livingston 2001, p. 83. ^ Carius 2003, p. 118. ^ Guderian 1952, p. 280. ^ Showalter 2013, p. 48. ^ Glantz 2005, p. 201. ^ Speer, Albert (1995). Inside the Third Reich. London: Weidenfeld & Nicolson. pp. 335–336. ISBN 9781842127353. ^ a b Jentz 1996, p. 13. ^ Schneider 2004, p. 43. ^ Schneider 2004, p. 44. ^ Forty, George (2009). "Tiger Tank Battalions in World War II". Zenith Imprint. pp. 47–50. ^ a b c Schneider 2005. ^ a b "The Maybach Engine". The Tiger I Information Center. ^ Green & Brown 2008, p. 86. ^ a b Carruthers 2013. ^ Zaloga 2015, p. 202. ^ Fletcher 2011, p. 139. ^ Jentz 1996, p. 202,230. ^ a b Wilbeck 2004, pp. 25, 99. ^ Zaloga 1994, pp. 6–7. ^ Boldyrev, Eugeni. "KV-85 Heavy Tank". The Russian Battlefield. Retrieved 20 October 2014. ^ Potapov, Valeri. "Development History of the JS-1/JS-2". The Russian Battlefield. Archived from the original on 7 September 2005. Retrieved 21 January 2015. ^ Zaloga 1994, p. 225. ^ Zaloga 2003, p. 13. ^ "BBC News – 'Last' WW2 Tiger tank to be used in Brad Pitt film". BBC News. ^ "Un char Tigre Allemand reconstruit avec des pièces de la poche de Falaise-Chambois". Ouest-France.fr. Anderson, Thomas (2013). Tiger. Osprey Publishing. ISBN 978-1-78096-201-6. Agte, Patrick (2006). Michael Wittmann and the Waffen SS Tiger Commanders of the Leibstandarte in WWII, Vol. 1. Mechanicsburg: Stackpole Books. ISBN 978-0-8117-3334-2. Baryatinsky, Mikhail (2008). The T-34 in Combat. Jauza, Moscow. ISBN 978-5-699-26709-5. Bird, Lorrin Rexford; Livingston, Robert D. (2001). World War II Ballistics – Armor and Gunnery. Albany, N.Y.: Overmatch Press. OCLC 71143143. Bishop, Chris (2002). "1". The Encyclopedia of Weapons of World War II. London: Metrobooks. ISBN 1-58663-762-2. Carius, Otto (2003). Tigers in the Mud – The Combat Career of German Panzer Commander Otto Carius. Translated by Edwards, Robert J. Stackpole Books. ISBN 978-0-8117-2911-6. Carruthers, Bob (2000). German Tanks at War. London: Cassell. ISBN 978-0-304-35394-1. Carruthers, Bob (2013). Tiger I in Combat. Coda Books Ltd. ISBN 978-1-78159-129-1. Drabkin, Artem; Sheremet, Oleg (2006). T-34 in action. Barnsley (S-Y): Pen & Sword Military. ISBN 1-84415-243-X. Fletcher, David (2011). Tiger Tank: Owners' Workshop Manual. Haynes Publishing. ISBN 978-0-7603-4078-3. Glantz, David (2005). Colossus Reborn : the Red Army at War : 1941–1943. Lawrence, KS: University of Kansas Press. ISBN 0-7006-1353-6. Green, Michael; Brown, James D. (2008). Tiger Tanks at War. St. Paul, MN: Zenith Press. ISBN 978-0-7603-3112-5. Guderian, Heinz (1952). Panzer Leader (Reissue edition, 2001 ed.). New York: Da Capo Press. Hart, Stephen (2007). Sherman Firefly vs Tiger: Normandy 1944. Reading: Osprey Publishing. ISBN 1-84603-150-8. Hunnicutt, Richard Pearce (1971). Pershing: A History of the Medium Tank T20 Series. Navato, CA: Presidio Press. ISBN 0-98219-070-0. Jentz, Thomas (1996). Panzertruppen 2: The Complete Guide to the Creation & Combat Employment of Germany's Tank Force 1943–1945. Schiffer. ISBN 978-0-7643-0080-6. Jentz, Tom; Doyle, Hillary (1993). Tiger 1 Heavy Tank 1942–45. illustrated by Sarson, Peter. Osprey. ISBN 978-1-85532-337-7. Jentz, Tom; Doyle, Hillary (1997). Germany's Tiger Tanks: Tiger I & II : Combat Tactics. Schiffer Publishing. ISBN 978-0-7643-0225-1. Jentz, Tom; Doyle, Hillary (2000). Germany's Tiger tanks D.W. to Tiger 1. Schiffer. ISBN 978-0-76431-038-6. Kolomiets, Maxim (2013). "Тигры" на Огненной Дуге "Тигры" на Огненной Дуге ["Tiger Tierra del Arc"] (in Russian). KM Strategy. ISBN 978-5-699-65932-6. Lochmann, Franz-Wilhelm; Rubbel, Alfred (2000). Combat History of German Tiger Tank Battalion 503. Mechanicsburg, PA, USA: Stackpole Books. ISBN 978-0-8117-3484-4. Perrett, Bryan (1999). Panzerkampfwagen IV medium tank : 1936 – 1945. Oxford, United Kingdom: Osprey. ISBN 978-1-85532-843-3. Schneider, Wolfgang (2004) [First published 2000 by J.J. Fedorowicz; Winnipeg]. Tigers in Combat I (2nd ed.). Mechanicsburg, PA: Stackpole Books. ISBN 0-8117-3171-5. Schneider, Wolfgang (2005). Tigers in Combat II. Mechanicsburg, PA: Stackpole Books; originally published 1998 by J.J. Fedorowicz; Winnipeg, Canada. ISBN 0-8117-3203-7. Showalter, Dennis E (2013). Armor and Blood : the Battle of Kursk, the turning point of World War II. New York, NY: Random House. Spielberger, Walter & Doyle, Hilary (2007). Tigers I and II and their variants. Pennsylvania: Schiffer Publishing Ltd, ISBN 978-0-7643-2780-3. Tucker-Jones, Anthony (2012). "Introduction". Tiger I and Tiger II. Barnsley: Pen & Sword Military. ISBN 978-1-78159-030-0. Wilbeck, Christopher (2004). Sledgehammers: Strengths and Flaws of Tiger Tank Battalions in World War II. Bedford, Pa.: The Aberjona Press. ISBN 978-0-9717650-2-3. Zaloga, Steven (1994). IS-2 Heavy Tank 1944–73. Osprey. ISBN 978-1-85532-396-4. Zaloga, Steven (2003). M4 (76mm) Medium Tank 1943–65. New Vanguard. Osprey. ISBN 1-84176-542-2. Zaloga, Steven (2005). US Anti-Tank Artillery 1941–45. New Vanguard. Osprey. ISBN 1-84176-690-9. Zaloga, Steven (2007). Japanese Tanks 1939–45. New Vanguard. Osprey. ISBN 978-1-84603-091-8. Bird, Lorrin Rexford; Livingston, Robert D. (2001). WWII Ballistics: Armor and Gunnery. Overmatch Press.